Rampage is the happy meal version of a movie. It's cheap and easy and you walk away mostly satisfied even if there was no nutritional value whatsoever. 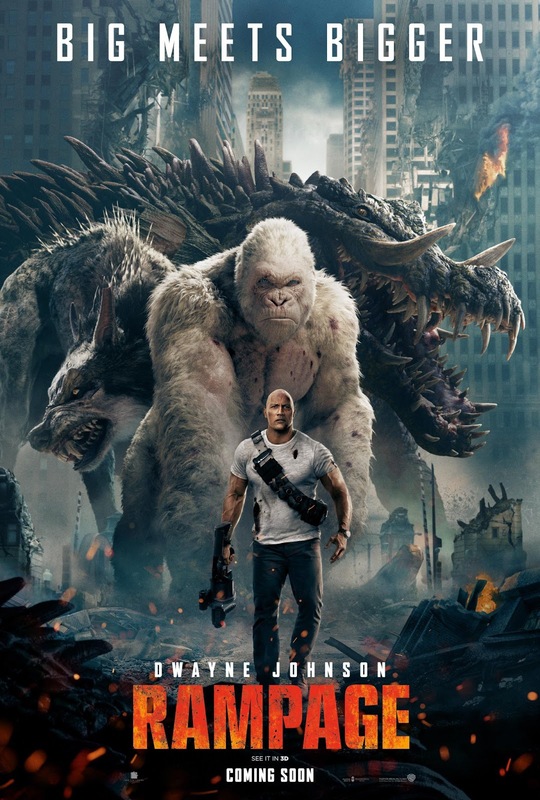 It's a strange world where Dwayne "The Rock" Johnson can still be seen in theaters in his last big-budget action adventure that involves a jungle and then the first time we see the chrome-domed former wrestler in Rampage he just so happens to once again be making his way through a similar environment; it’s as if the star is guiding us out of one movie and into the next. As we are welcomed into this new world of Rampage by The Rock himself we are introduced to his Davis Okoye, a primatologist AKA someone who studies nonhuman primates, who works at the San Diego Zoo and has essentially fostered one of the last remaining albino gorillas to be his own. George, as played through motion capture not by Andy Serkis, but by Jason Liles, is a seven foot tall, five hundred plus-pound primate who can communicate with Johnson's Davis with as much ease as a deaf child might be able to communicate with their hearing enabled parent and who also has a good sense of humor about himself and his circumstances. The one thing Rampage does better than it has any right to do is develop this relationship between the two biggest stars on screen meaning Johnson is really just that good at making audiences believe he is the coolest guy around. Not everyone could make befriending a monkey cool and inspiring as opposed to the weird and off-putting looks most would get, but the guy does it; acting as if it's the most normal thing in the world and oh yeah, he was also part of an anti-poaching military force once upon a time too, so stick that in your pipe and smoke it. And sure, the fact it’s The Rock that is both this intelligent and extremely fit guy who clearly has a streak of compassion with an especially soft spot for animals is part of the appeal in Rampage as it is the ability The Rock brings along with his presence that makes a movie as ridiculous as this work as well as it does…even if it probably shouldn't. That said, and having never played the video game on which this is based, I expected the latest from director Brad Peyton (Journey 2: The Mysterious Island, San Andreas) to be a little more fun than this ends up being. Yes, there are moments of pure outrageous bliss, but they are too few and far between to make Rampage feel like the large-sized combo it was advertised to be. Rather, Rampage is drenched in that Happy Meal feeling from its quick and easy delivery to its processed if not convenient conclusion. Davis Okoye (Dwayne "The Rock" Johnson) helps protect his primate friend George (Jason Liles). 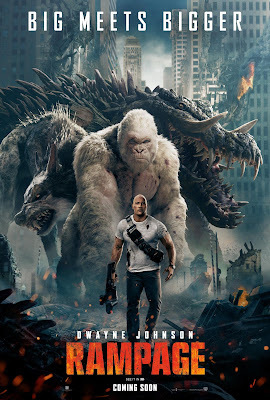 While it was somewhat striking to, upon introduction, see Johnson again making his way through the greenery of a lush jungle after just re-visiting his massive Jumanji sequel that arrived on home video less than a few weeks ago, Rampage actually begins quite a ways from our planet. On a space station owned by the inevitable evil corporation that is a part of the plot-this time around and run by the diabolical Claire Wyden (Malin Akerman) and her stooge of a brother, Brett (Jake Lacy), nasty things are happening. The Wyden's highly unethical company, Energyne, has apparently been conducting genetic experiments in space as the movie actually opens with a giant rat chasing down the only surviving astronaut on board (Marley Shelton). Shelton's character makes it through to the escape pod where she has safely secured samples of the chemical toxin that turned the lab rat into the dino rat, but while the escape pod appears to get away just in the nick of time it may have sustained too much damage to survive re-entry. The samples, however, do (with this convenience being defended by a throwaway line from Claire) and end up landing at different points on Earth where they infect a rogue wolf, an alligator, and Davis' extraordinarily intelligent, silverback gorilla. George begins to grow rapidly and get angrier and all the more vicious as opposed to the tame and rather compliant beast we've witnessed thus far. Naturally, Davis is concerned with what is happening to his friend and his first instinct is to figure out what happened and how to fix it. Things become slightly more complicated when former Energyne employee and genetic engineer Dr. Kate Caldwell (Naomie Harris) shows up claiming to be the only one who knows how to cure George, but seemingly has an agenda of her own and even more complicated when an off-the-books government agency led by self-proclaimed cowboy Harvey Russell (Jeffrey Dean Morgan) struts in to try and take control of the situation. As Davis and Kate team-up to try and track down the cure and only hope of saving George, Harvey informs the two of them that George isn't the only newly-minted monster tearing across North America. It turns out, George and his new pals have made a b-line for picturesque Chicago due to the fact Claire has placed some type of homing beacon atop she and her brother's billion-dollar company's flagship office building and are drawing the monsters there to try and evade any connection to these mishaps. It doesn't make too much sense, but is more an excuse to execute a monster attack on a big metropolitan area so as to honor the source material as much as possible. It's nonsensical, but it does what it promises. And this brings to light the biggest issue to be taken away from Rampage in that it does what it promises in earnest, but the experience never builds to be as fun or entertaining as those promises would lead one to believe. Yes, Johnson makes a lot of this work better than it should and better than it would have without his reliable presence on board and to give credit where credit is due Peyton is a pro when it comes to staging massive action sequences and presenting them in a clear way to the audience in terms of understanding where one giant gorilla is in relation to Johnson (who is apparently as indestructible as his primate pal) in relation to the giant alligator that is coming for both of them. This is all well and good and despite the visual effects having something of an inauthentic sheen to them as the monsters jump from skyscraper to skyscraper the animal's themselves-well, mainly George-look fantastic among the otherwise live-action elements of the film. The sequence in which the giant wolf is introduced that features a short-lived appearance by Joe Manganiello is at one point the most lifeless sequence in the entire film due to the lack of weight afforded by the digital creation, but as it culminates with this giant creature leaping out of the wooded area in which it has been shrouded thus far and devouring a helicopter as if it were a treat it was owed Rampage is certainly something; something enough to make this movie-goer wish there was a local IMAX screen to have experienced the film on. Come to think of it, the experience of this particular sequence is akin to the experience of the movie overall as Peyton and his team are able to balance out the more tawdry elements of the thin story and even thinner premise with some jaw-dropping spectacle, but whereas the quota for each feels even by the time the credits begin to roll. There is also this sense of relief that they were all able to make it just past the ninety-minute mark with something resembling a coherent motion picture forcing the movie to never be able to move past the basic requirements of a blockbuster into something more or necessarily special. The thrills and fun are there in moments, but when compared to how self-aware and earnest the movie is as a whole it's disappointingly average in the enjoyment department. To compare, in the midst of Rampage going through its motions it was unavoidable to not compare it to the similarly staged Pacific Rim sequel a few weeks back where things were equally cartoonish and had a fair amount invested in its characters, but also managed to make the sometimes overly convoluted plot a ton of fun to witness. It's understood from the get-go we're not here for anything deep, but if Rampage was only going to be about the hubbub in the city it needed to deliver on this scope in a more sprawling fashion. A genetically edited wolf invades downtown Chicago in the big-screen version of Rampage. What is clear from seeing Rampage take over the big screen though, is that Peyton and his four screenwriters(!!!) were intent on making this as light and as much dumb fun as they could and as noted before, there are moments within the chaos where as much is accomplished. And so, what is it that makes Rampage work in ways that show its full potential here and there? First and foremost is the obvious factor of Johnson whose contributions have already been discussed and trust when it is said that Johnson's appeal is in full effect here for, despite the main event being the two plus-sized carnivores and Davis' herbivore duke it out with skyscrapers (I guess we know how Johnson's next tentpole will begin, eh? ), it is Johnson who has to carry both the weight of the story as well as the emotional heft of the film that begins and ends with Davis' connection to George and his maintaining of George's innocence in everything that goes down. It would seem inevitable that each of these animals who have been unjustly turned into monsters would all ultimately meet the same inevitable fate, but as with the film's villains Rampage dares to surprise you in ways even if they don't always make complete sense. Speaking of those villains, Rampage wouldn't have been complete without the evil corporation-types devising a dastardly plan and both Akerman and Lacy play up these personas with pure bliss. The arcade version of Rampage is actually sitting in the Wyden's office and can be seen in some of the early scenes featuring the duo and it's as if the siblings have such a fondness for that original video game and that time in their lives when it was first released (1986) that they grew up to embody the baddies of the Saturday morning cartoons they experienced during that same phase. Why they have decided to try and "edit DNA" for the purposes of war or some such nonsense is never really made clear and their plan to draw the monsters back to their base of operations in order to get what they want and clear their names makes even less sense, but most of this is easy to forgive due to the sheer amount of fun the two actors are having playing into these archetypes. And while it is unfortunate that Harris (an Oscar nominee for her performance in the Oscar-winning Moonlight) is largely used as a supporting character who exists to spout exposition and fill in the gaps where Johnson's primatologist isn't as experienced or knowledgeable (breaking into Energyne, locating the serum, etc.) Morgan is arguably given less to work with, but makes the most out of it. His southern swagger never tires and the joke isn't given enough screen time to get played out, but instead these short injections of humor help contribute to that balance that makes Rampage only the slightest bit memorable. Morgan is cheesing through so much of his role in fact, you would think he'd just finished scarfing down a happy meal and throwing away the cheap toy inside the bag. You know, just as you'll do with your Rampage experience.